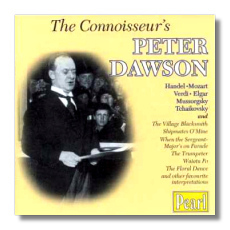 In the 20s and 30s, Peter Dawson's recordings probably sold about as well as any other male singer's. One estimate is that over a fifty-two year (!) association with HMV, he made more than three thousand discs which, all told, sold more than twenty-five million copies. He was one of those musicians who resist classification; was he a popular singer who also excelled in opera, or a classical singer who didn't shame himself in the popular repertoire? American singers who occupied a similar (but by no means identical) niche include John Charles Thomas, Lawrence Tibbett, and Nelson Eddy. This CD collects twenty Dawson 78s recorded between 1926 and 1938. The repertoire is of two types. First come classical selections, all sung in English. Dawson's Song of the Flea yields little to Feodor Chaliapin's justly famous recording, and his Don Juan's Serenade (Tchaikovsky) is without question the best I've heard (an opinion I share with Roger Beardsley, this CD's producer and transfer engineer). Other selections include Iago's "Credo" from Otello ("Cruel is he"), "Non più andrai" from The Marriage of Figaro (happily, "Now your days of philandering are over"), Schubert's Erl King, and arias from Handel's Samson and Elgar's Caractacus. The second type of repertoire is semi-classical – Dawson's meat and potatoes, as it were. These are the recordings that made him famous. Here we have, among others, The Village Blacksmith, Shipmates o'mine, When the Sergeant-Major's on Parade, Waiata Po, and The Floral Dance. The last title was Dawson's "greatest hit"; here Beardsey has selected not the famous 1934 version with orchestra, but a version from 1927, with the formidable Gerald Moore at the piano. Under the care of a lesser singer, most of these songs would be mere sow's ears, risible additions to today's concert programs. Dawson's glorious voice and enormous personality, however, make them sound like silk purses, except silk is too fine a material to characterize this frankly macho singer with. Of other singers I've heard, only John Charles Thomas had a similar ability to take absolutely embarrassing material and make it masterful. Dawson's range encompassed more than two octaves, and his voice remained masculine and timbrally attractive no matter how high (or low) he sang. His wonderful English diction made him a natural for Gilbert and Sullivan, and his vocal acting skills allowed him to be anyone he wanted to be within the course of two measures. But even when he was singing evil Iago's music, he remained a deeply likable singer. It's no wonder that millions upon millions of record-buyers and concert-goers loved him. The transfers on this disc are superb; I never would have guessed that most of these 78s come from the very first years of the electric era. Pearl's extensive attention to this singer is well deserved, and they do him proud with the high quality of this compilation. It's a great place for initiates. And Dawson initiates have a way of becoming undying Dawson fans. Peter Dawson was born in 1882 in Australia, and he died in 1961.